Biostar releases its first SSD line, we give you a look at the PC Gamer team's personal rigs, and more! It's been another busy week in the land of PC gaming hardware highlighted by more product releases, including new capacity options for Crucial's MX300 SSD line and Biostar's first ever line of SSDs, the latter of which are heavy on the hype but low on price. We also took a look at rigs belonging to the PC Gamer team this week and provided a brief history of PC case design. If you missed any of it, don't fret, we have your recap right here! 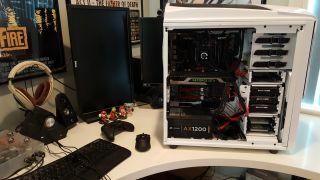 We love it when developers show us their rigs, and we were overwhelmed with responses when PC Gamer readers showed us their rigs. It was time we returned the favor. These are the systems we game on at home. How does your PC measure up? Today's top consumer graphics chips are more than adequate for the needs of gamers, with models sporting 8GB and even 12GB of memory. Professional graphics is an entirely different story, however; Nvidia's top Quadro M6000 has 24GB of GDDR4, while AMD's FirePro S9170 has 32GB GDDR5. That might seem like an obscene amount of memory, but for some workloads even that could prove woefully inadequate. At SIGGRAPH, AMD announced and demonstrated a working solution that they're calling Radeon Pro SSG—Solid State Graphics—starting at a full 1TB of 'memory' on the board. For the math impaired, that works out to 32 times more capacity than the S9170, or more than an order of magnitude increase. And this isn't just a pipe dream, as AMD announced that they'll be selling the cards in a developer's kit starting in 2017, with a price of $10,000 per card. AMD has made available a new Radeon Crimson driver (16.7.3) that comes with a few perks for Radeon RX 480 graphics card owners, the biggest being an up to 10 percent performance gain in Rise of the Tomb Raider. In AMD's testing on a system equipped with an Intel Core i7-5960X processor and 16GB of DDR4-2666 RAM, the Radeon RX 480 scored 78.73 fps on the previous Crimson driver (16.7.2) to 86.53 fps on the latest driver release, both running the game at 1920x1080. Other benefits for Radeon RX 480 graphics card owners include a couple of bug fixes specific to their setups. AMD says it tracked down and squashed a bug that caused Overwatch to crash on some Radeon RX 480 configurations when using Crossfire mode, and also got rid of a minor flickering issue affecting RX 480 owners when Freesync is enabled when launching or exiting a game. Crucial today expanded its recently introduced MX300 solid state drive with additional capacities, now giving you four relatively affordable SKUs to choose from instead of just one: 275GB, 525GB, 750GB, and 1TB. Previously it was only available in a limited edition 750GB SKU. Following in Samsung's footsteps with its 850/950 Pro SSDs, Crucial and its parent company Micron are wading into 3D NAND flash waters with the MX300 line, albeit at a more casual pace. Whereas Samsung is targeting enthusiasts with flagship solutions, Crucial's MX300 SSDs take aim at mainstream users, which is reflected both in price and rated performance. If there's one part of the a PC that can be an expression of the builder's personality, it's the case. Today, cases come in myriad sizes and shapes and offer a wide array of features, but it wasn't always this way. PC cases used to be beige, heavy, and unwieldy. The 2006 Dream Machine departed a bit by opting for an aluminum chassis, and improved its appearance with a paint job inspired by race cars. As time passed by, case manufacturers experimented with new features. Some designs failed, others became standards that we expect in modern cases. Today's PCs are often smaller and offer luxuries that we would've died for in 2000: sliding hard drive trays, magnetic dust filters, and cable management galore. It's taken a lot of iteration (and some weird design) to get to the PC cases of 2016. Let's take a look back. One of the outcomes of the historic Brexit vote that began the process of taking the UK out of the EU was the imposition of higher prices for computer hardware. As we reported last month, Dell jacked its prices by ten percent to compensate for the cratered value of the pound sterling, while HP and Lenovo were reportedly considering similar moves. Today there was more bad news, as HTC announced that the price of the Vive VR headset has jumped from £689 to £759. Back in early 2015, Nvidia was hit with a false advertising lawsuit over claims that the listed specs for its GTX970 video card were not accurate. Simply put, the 4GB of GDDR5 RAM the card was supposed to come with was actually 3.5GB of GDDR5 and a separate 500MB block running at a significantly slower speed. This isn't an issue for games that don't break the 3.5GB limit, but as Wes explained when the problem first came to light, it's a real problem for those that do. The discrepancy, which Nvidia blamed on a breakdown in communications between its engineering and PR teams, actually led to multiple lawsuits, all of which, according to Top Class Actions, have now been settled. Nvidia has agreed to pay $30 to individual buyers of GTX970 cards, and also to cover $1.3 million in lawyer's fees. The total settlement amount wasn't revealed in court filings, but there will not be a cap on the total amount it pays off. The individual payment amount “was calculated to represent a portion of the cost of the storage and performance capabilities the consumers thought they were obtaining in the purchase of the product,” according to the report. Patriot Memory is puffing its chest today over reaching a new frequency for its top-end DDR4 RAM kits. Specifically, it's Viper 4 and Viper Elite DDR4 lines are both now available in 3,733MHz dual-channel kits. That's the highest frequency Patriot offers on any of its RAM kits, though if you're going for an overclocking record, there are faster clocked memory options out there. G.Skill, for example, offers several higher frequency memory kits, including an 8GB Trident-Z kit rated at 4,266MHz. .Asus demonstrated the concept on a variety of modified X99 motherboards at Computex 2016 as part of its "Make It Your Own" 3D printing project, an initiative to take PC modding to the next level.